Anyway, Miles' version of Hark the Herald Angels Sing reminded me that I hadn't yet posted about our recent trip to NYC!!! I know I Instagrammed, but I wanted to get our trip down in this little spot too! We left on the 17th of December and went with the Stouts, some dear friends of ours, and it was just the four of us! We collectively left all 8 of our children in the hands of grandparents! People, if we can figure out a way to do it, then you can too. And you should! Ohhh, we had a blast! We nearly ate our way through the entire city! We had our first brunch, more like pastries, at Ferrara's in Little Italy. And from there we dipped into Chinatown (and left quickly due to some shady dealings going on around us) and then onto SoHo! We window-shopped a smidge and popped into Happy Socks where the men bought some fun! And I stopped into Bite for a little splurge and designed my own lipstick! 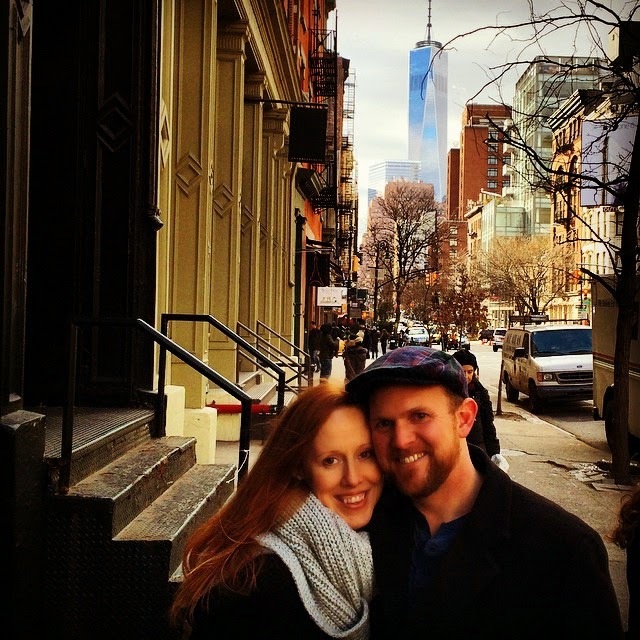 We explored more, at in Little Italy, and headed off to see Aladdin that night! 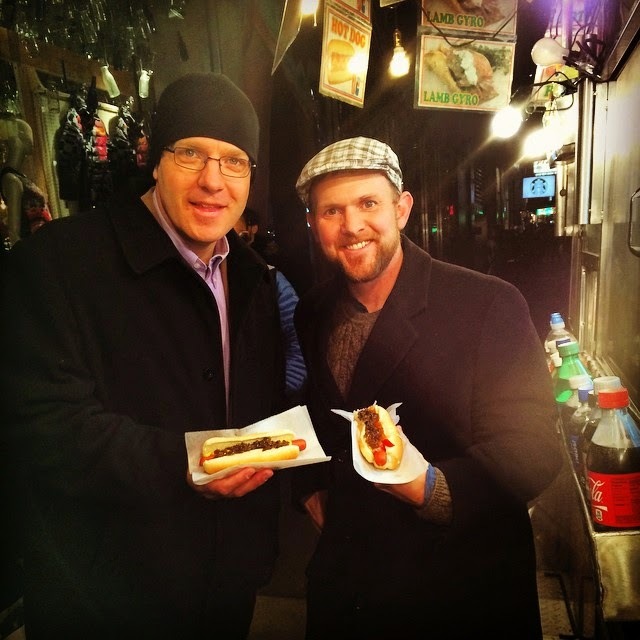 You can't pass up a hotdog stand on the corner of NYC. So, we ate again! The show was great! The Genie was quite funny and of course those Disney songs were wonderful! 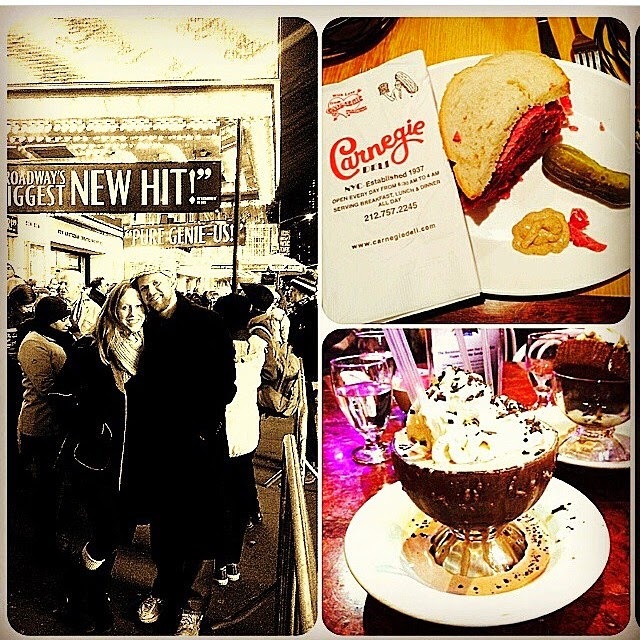 We soaked up some Time Square with a million other people and took Dana and Kevin to Carnegie Deli! 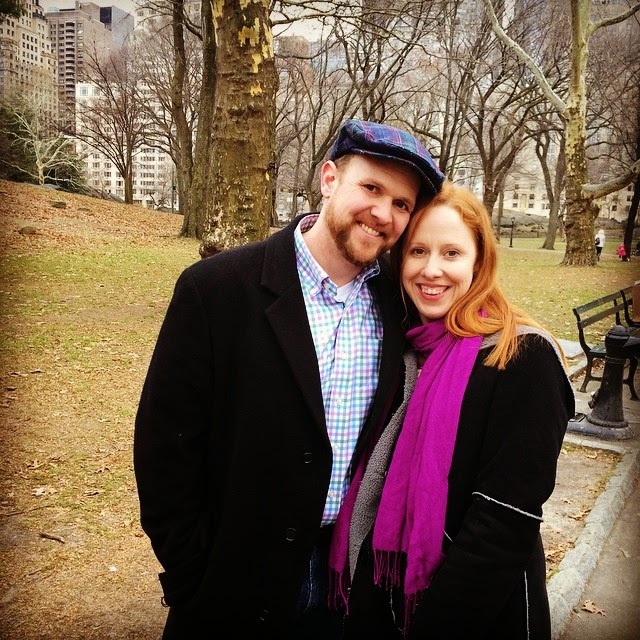 Hubby and I had been before, but this was Dana and Kevin's first NYC trip. They, of course, had to experience the ginormous sandwiches! And because we were still hungry (HA! ), we had to hit up Serendipity 3 as well! I can't even write about my frozen hot chocolate without salivating. And Hubby might have never had something so delicious--but his wasn't chocolate. Just heaven. And that was just Day 1. OH my goodness!! 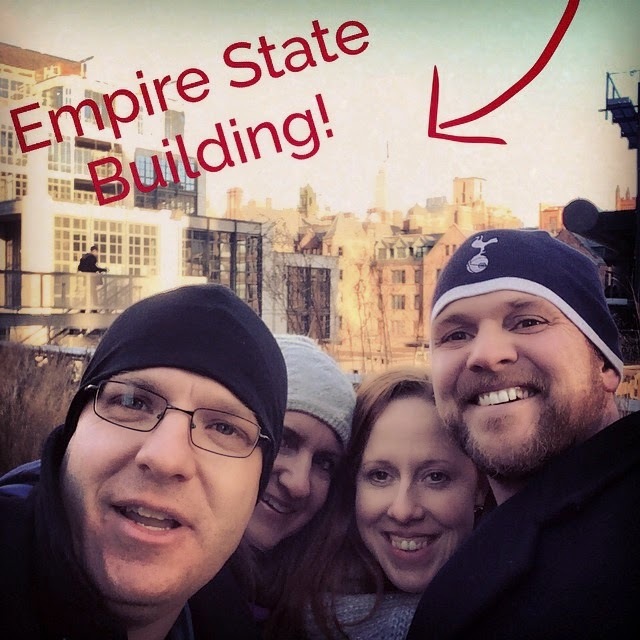 Over the course of our next few days, we went to the 9/11 Memorial and museum--something you don't want to miss. I get extremely emotional over the entire event and anything related, so I wasn't sure how I felt about going. So, so glad we did. We also continued eating our way through the city and snagged some pizza in Brooklyn! Love these friends!! We naturally had to walk off our meals and chose to hit the High Line! It was cold and I'm positive in the spring and summer it would be an amazing site to see! We learned about the High Line from a book our boys have, The Curious Garden. We've enjoyed the book for a few years, so it was fun to go walk the High Line! We, of course, kept eating, window-shopped the West Village, worshipped at Redeemer Pres. and heard Tim Keller, dreamed of moving to NYC, window-shopped 5th Avenue, and so much more! 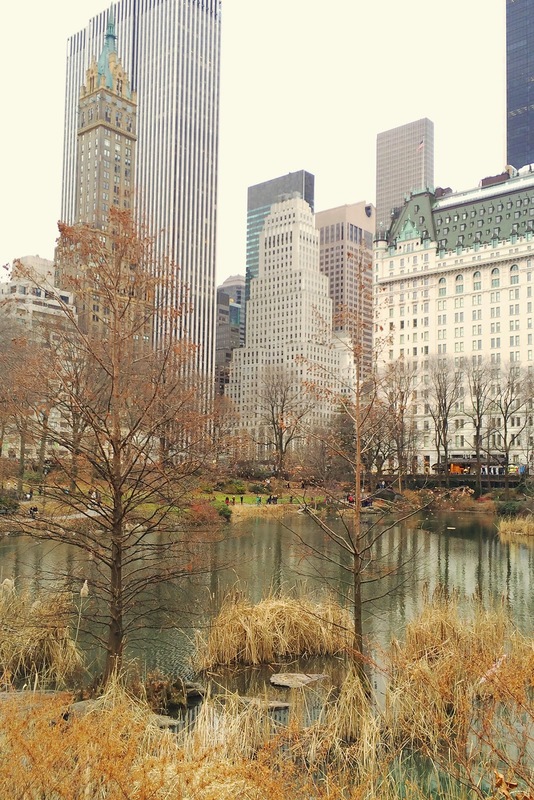 And what's NYC without more Broadway, Central Park and Rockefeller Center??? Ahhhhh! I love the hustle and bustle of NYC! 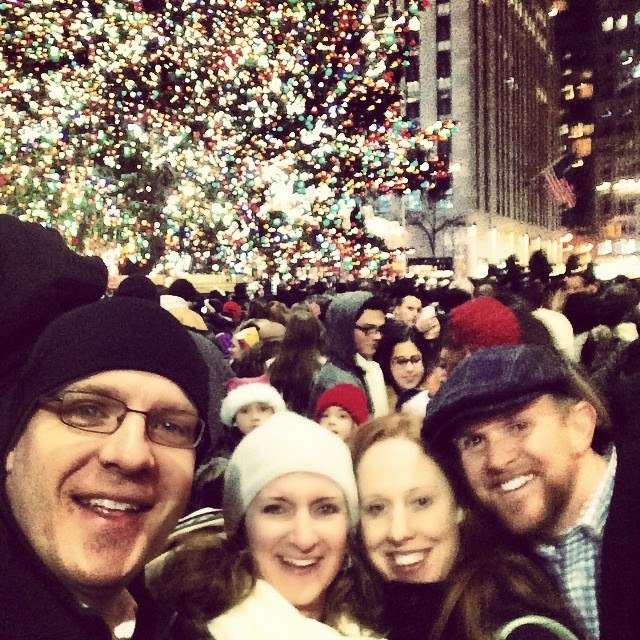 I loved it at Christmas--it truly is an amazing city to see during the holidays! BUT---being with my Hubby and our sweet friends was the best part! We are so thankful for my parents who held down the fort back home! We ALL love our 8 children, but to spend time as just a couple and with friends is priceless! It was a trip that we will always cherish! Love you, Stouts!! Loved following along on IG! Sounds like the perfect getaway during the busy holiday season.